Digital rights group Fight for the Future encourages the public to oppose fast track trade legislation in the U.S. Senate. The fast-track trade legislation, which could come to a final vote in the Senate by early June, would allow the Obama administration to negotiate the Trans-Pacific Partnership (TPP) and other trade deals with limited congressional input. And while several business and tech groups praised the vote, some digital rights groups vowed to continue their fight against trade promotion authority and the TPP as they are concerned about copyright provisions leaked from the secretive TPP negotiations. Lawmakers should be wary of awakening the fury of the many Internet users opposed to TPP, said Evan Greer, campaign manager for digital rights group Fight for the Future. Lawmakers could face a backlash similar to the Internet activism opposed to the Stop Online Piracy Act (SOPA) in 2011 and 2012, he said by email. Copyright industries are using fast-track trade legislation and the TPP to "quietly push for extreme policies that the public would never accept if they were proposed openly," Greer said. "The future of the Internet is too important to be decided in secret or through backroom deals and Senate horse-trading." Tens of thousands of Internet users, using tools from Fight for the Future and other groups, have contacted their lawmakers in opposition to the fast-track legislation and TPP, he said. 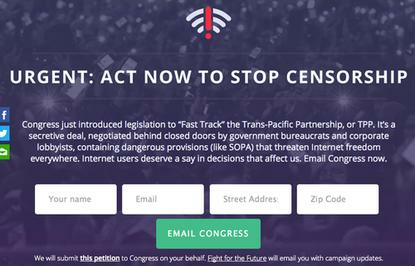 "This should be clear: Any member of Congress who votes for fast track/trade promotion authority is voting against the basic rights of every Internet user in the world," he added. "They should take a look at recent history from SOPA to net neutrality: Hell hath no fury like the Internet scorned." Still, the hard-to-understand TPP has generated only a fraction of the Internet activism that was generated by the SOPA debate or a recent fight over net neutrality rules. The issue has split some of the natural allies focused on online copyright issues, with Senator Ron Wyden, an Oregon Democrat and digital rights champion, and some copyright-wary trade groups supporting fast-track trade authority. Business and tech trade groups have pushed for trade promotion authority, saying new trade deals would make it easier for U.S. companies to sell their products in other countries. Intel called this week's Senate vote a "critical step" toward opening up global markets for U.S. companies. The Senate vote "sends a strong message to America's trading partners that we're serious" about the TPP negotiations and about pushing for high standards on copyright protection, labor rights and environmental protection, the company said in a statement. The TPP, first proposed a decade ago, has been negotiated in secret, but leaks have shown that the U.S. and some other countries are pushing for signatory nations to adopt strong new intellectual property laws. There are several other unrelated complaints about the agreement, but most of the criticism has focused on copyright issues and on a lack of transparency about the negotiations. Based on the leaks, the U.S. and other nations are pushing strong new intellectual property protections that would require some signatory countries to rewrite their existing laws, criminalize noncommercial sharing of works protected by copyright, and, critics say, create new criminal penalties for whistleblowers and journalists who access computer systems without permission. The trade promotion authority legislation would set some congressional priorities for the TPP and other trade deals while allowing the Obama administration wide latitude to negotiate the deals. The legislation would prohibit Congress from adding amendments to trade deals negotiated by the administration when it's time for Congress to vote on them. If the Senate approves the trade promotion authority bill, the House of Representatives would also have to approve it before it would go to Obama for his signature. Backers of the trade promotion authority in Congress have called for the Obama administration to push for balanced copyright polices, including legal protections for websites where users post content, according to trade group the Computer and Communications Industry Association. The Senate action lays "the foundation for a new era of online international trade," CCIA President and CEO Ed Black said by email. "The goals that [trade promotion authority] sets forth for digital trade are not merely desirable, but essential to the growth of Internet and technology service exports."